Rome, Italy is best known for its stunning museums, eye-opening architecture and, of course, the Vatican City it surrounds. Given the ancient age of many of its buildings, it comes as no surprise the many secrets to be discovered throughout. One such building housing its own fair share of secrets is the Castel Sant’Angelo, a haven for religious officials as early as 590 AD! The great Castel Sant’Angelo in Rome, Italy. and a museum, as it is today. Its extensive history makes it a distinct Roman icon that celebrates the long history of Rome. The majority of the time it’s been standing has been spent as a refuge for popes and other military officials. In fact, its name stems from 590 AD when Pope Gregory the Great claimed St. Michael appeared above the castle in a vision, signifying the end of the plague. Just as you’d expect from an ancient castle, Castel Sant’Angelo has its share of secrets. One of the biggest ones, although not much of a secret now, is the 2,600-foot passageway between the Vatican City and the Castel Sant’Angelo. It was used as an escape route for many Popes over the hundreds of years in dire situations. Being also used as a prison and barracks, there are many rooms that look like an ordinary room to us now but had dark purposes in their day. What may be a gallery now could have been used to interrogate prisoners hundreds of years ago. Which rooms? Well, that remains a mystery. 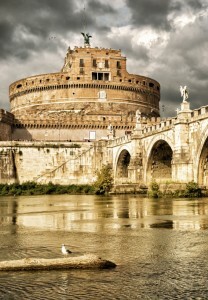 Travel to Rome and see Castel Sant’Angelo in person! AESU offers several trips to Italy, including: Cosmopolitan, Explorer, Euro Focus, Great Escape, Viva Italia, and Euro Spree. Explore Italy and its ancient architecture, plus visit Castel Sant’Angelo in Italy and investigate its secrets and mysteries. If you have any questions or want help booking your Rome adventure, please contact AESU by calling 800-638-7640, or fill out the contact form found on our website! This entry was posted on Thursday, January 21st, 2016	at 4:19 pm	. You can follow any responses to this entry through the RSS 2.0	feed. Both comments and pings are currently closed.